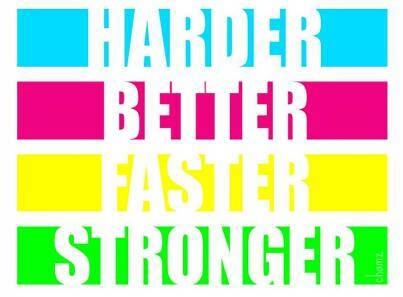 Harder, Better, Faster, Stronger is my predication for what AgencyLife is going to be like – no, HAS to be like – if the industry is to adapt to the realities of life in 2010. After 2009’s redundancies and cost cutting, there will be less people around to do more work as clients start to spend again, but agencies seem to be reluctant to staff up to meet that demand. Recruitment contacts tell me that the majority of vacancies are only coming up when agencies gain a big new client and don’t have the account handling slack to accommodate them. Worryingly, this doesn’t seem to be being reflected in creative recruitment or freelancing, so it could be a particularly busy 2010 for overstretched creative departments. Being brutal, anyone who was treading water in an agency, non-essential to operations or just not that good has probably been made redundant by now. Lots of good, talented, experienced, decent people went too, but inevitably, those that remain and haven’t been tempted away by clientside salaries or voluntary redundancy packages are going to be pretty blumin good at and dedicated to their jobs. Add to that a tiny dash of New Year’s Optimism and clients being a little more open to trying new things to make their depleted budgets work harder and you have a great environment in which to produce some terrific work. But in these challenging conditions, the really good agencies and really good people will shine out. If agencies can adapt to the changing economy, technology and environment while still turning out great, creative, effective work, then they truly deserve to rise to the top of the pile. It’s going to be survival of the fittest – and of the fastest to adapt.